This image is undated; however it cannot be later than 1938 as this copy of the postcard bears a postmark of that date. Copy of a photograph of the front of Cornard Mill at Great Cornard, Suffolk. Photographed by Mr. Baker circa 1906. Copy of a photograph again showing the small windpump in front of Cornard Mill at Great Cornard. Photographed by Mr. Baker circa 1860. 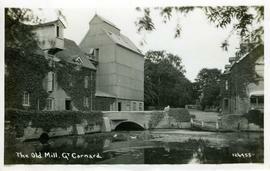 Copy of a photograph of Cornard Mill in Great Cornard, Suffolk. 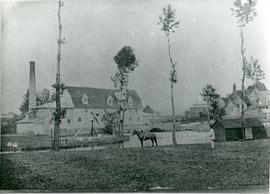 This photograph shows the mill after having been rebuilt, circa 1900. Photographed by Mr. Baker.